It was an entertaining Saturday evening from the New York Ranger and New York Islander prospects as we are down to 8 days left in the CHL regular season and depending on which league the NCAAs as well. What is a shame is that really nobody stepped up on such a key evening with a solid game. Oh there were players who had strong periods but hockey is a 3 period game and you won't win many games just by having a single period. It has been a very frustrating season for sophomore Cristoval "Boo" Nieves (NYR 2012 2nd) of the 11th ranked Michigan Wolverines. Going into the game against arch rival Michigan State, Nieves was just 2-15-17 and that was with 4 assists coming in his last 2 games. Against Michigan State Nieves had a season high 1-2-3 in a losing effort as Michigan State rallied from down 3-1 to earn a 4-3 win. Nieves had a strong first period starting with setting up linemate Luke Moffatt for a goal just 1:15 into the game for a 1-0 lead. Just 3:28 later it would be Nieves with a solid goal of his own as he took a pass from the corner and while using his foot got the puck to his backhand and then went top shelf for his 3rd goal of the season. 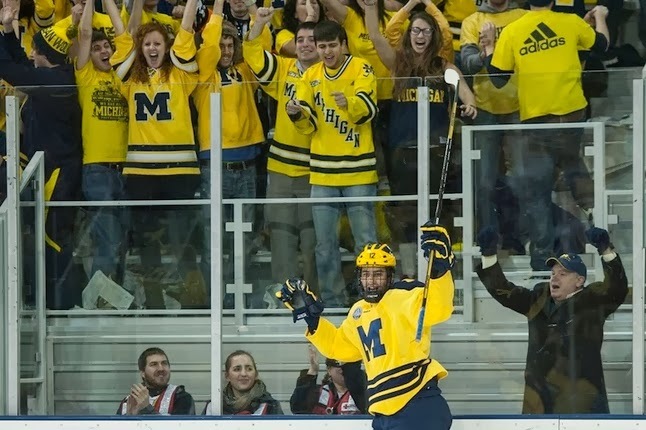 Finally with Michigan up 2-1, Nieves would earn a secondary assist on Phil Di Giuseppe's goal at 17:23 which made it 3-1. From there that was the end of the story for Michigan as Michigan State would score 3 unanswered goals to earn the win and ensure that Michigan will not finish any better than 3rd in the Big Ten. For Nieves the night improved his numbers to 3-17-20 as he has a 3 game scoring streak going now (1-7-8). Troy Donnay (NYR 2013 UFA) was 1-1-2 with a +3 while teammate Adam Pelech (NYI 2012 3rd) was 0-1-1 +1 as their Erie Otters won their 5th straight game 7-3 over the Kitchener Rangers. Donnay scored a shorthanded empty net goal with Pelech getting the primary assist at 18:50 of the 3rd period making the score 6-3. Donnay earlier had a secondary assist on Erie's first goal of the game as Erie spotted Kitchener a 2-0 lead before taking over the game. Donnay is now 2-15-17 while Pelech is 9-43-52 which is 5th among OHL defensemen. Ryan Graves (NYR 2013 4th) was scoreless on 3 shots but had a game high 6 hits as his Val-d Or Foreurs defeated the Gatineau Olympiquea 5-2. The win pulled the Foreurs to within 1 point of the Blainville-Boisbriand Armada for first place in the QMJHL's Telus West Division with just 3 games remaining for both teams. Always love it when a defender plays a strong physical game like Graves did here. Loic Leduc (NYI 2012 4th) was scoreless on a -1 with 2 hits as his Rimouski Oceanic won their 14th straight game a 5-4 thriller over Baie-Comeau Drakkar. This win pulls the Oceanic to within 2 points of the Drakkar not only for the Telus East Division but the top spot overall in the QMJHL. The Oceanic hold a game in hand but the Drakkar hold the tiebreaker edge with more wins. The Oceanic will most likely need to win out their final 3 games and need somebody to either beat the Drakkar. Mackenzie Skapski (NYR 2013 6th) really only had to work hard during the 3rd period of his Kootenay Ice's game against the Regina Pats as the Ice earned a 3-1 win. The Pats were missing their captain Kyle Burroughs (NYI 2013 7th) and until the 3rd period were not mustering up much of a fight. Skapski faced just 3 shots in the 1st and 6 in the 2nd before the Pats got going firing 19 shots on the Ice goalie who only gave up the one goal. Skapski improves to 28-17-2-1 with a 2.64 goals against and a 0.918 save percentage. The 5th placed Ice (holds game in hand) hold a 3 point lead over 6th placed Swift Current but their hopes of catching 4th place Medicine Hat took a hit when Medicine Hat won. Kootenay is 6 points behind Medicine Hat with 4 games left. Then we have the Edmonton Oil Kings and the Calgary Hitmen as these 2 teams are doing their best to give the other team the WHL's Eastern Conference title by losing the most to losing teams. Saturday night it was Griffin Reinhart (NYI 2012 1st) and his Oil Kings to blow a game as they lost to the Moose Jaw Warriors. To be fair the Oil Kings were playing their 4th game in 5 nights on the road but losing to the Warriors cost them their 2 point lead over Calgary. Reinhart had a secondary assist on the Oil King's only goal which game in the 3rd period but just wasn't enough to prevent the loss. Reinhart is 3-17-20 0n the season as Edmonton heads home. Adam Tambellini (NYR 2013 3rd) and his Calgary Hitmen did just enough to defeat the Saskatoon Blades 2-1. Tambellini was scoreless as the Hitmen moved back into a virtual tie for the WHL's Eastern Conference top spot. Edmonton holds the edge in wins plus a game in hand. Ryan Pulock (NYI 2013 1st) could find himself watching New York Islander games in person much sooner than anyone expects as his Brandon Wheat Kings are playing themselves out of a playoff spot. Pulock was scoreless as his Wheat Kings dropped a 3-2 decision to the Prince Albert Raiders. The loss dropped the Wheat Kings into 9th place in the WHL's Eastern Conference tied in points with the Raiders and the Red Deer Rebels. If the season were to end tonight the Wheat Kings would be on the outside looking in. Prince Albert has 4 games remaining while Red Deer and Brandon both have 3 but for Brandon this is just not looking good as they finish their season with games against Saskatoon and a home and home with first place Regina. Give Pulock a map and let him head to Long Island for a chance to work on his development. Steven Fogarty (NYR 2011 3rd) was scoreless as his Notre Dame Fighting Irish defeated Doyle Somerby's (NYI 2012 5th) Boston University Terriers 3-2 in the first round of the Hockey East playoffs. Notre Dame moves on to play Boston College next weekend while Somerby's season comes to an end. Doyle Somerby finishes his freshman season 1-3-4 as the 6'5 defender appeared in 34 games for the rebuilding Terriers who were playing under a new coach so for now Somerby gets a pass on his season. Taylor Cammarata (NYI 2013 3rd) was scoreless as was teammate Brady Skjei (NYR 2012 1st) as their top ranked Minnesota Golden Gophers played to a 2-2 overtime tie against Ohio State. Minnesota misses out on a chance to clinch an outright Big Ten title but will have 2 games against Michigan next weekend. Jake Bischoff (NYI 2012 6th) was a healthy scratch in this game as were Eamon McAdam (NYI 2013 3rd) of Penn State and Stephon Williams (NYI 2013 4th) of Minnesota State. Sadly the news is not good as it is being reported by some very reliable sources that Bozon has been placed in a "medically induced coma"
The Prospect Park. Awesome Inc. theme. Powered by Blogger.